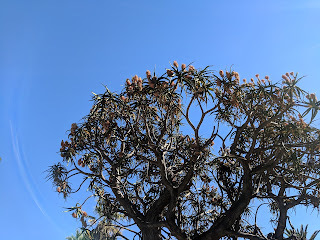 This might seem like an odd thing to post right now (in March!) but while the gardening season is getting started, i wanted to record for myself how i enjoyed the garden last summer. 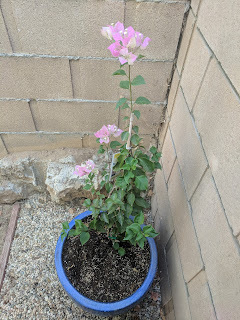 It gets seriously hot here in the summer, and before 2018, i felt like i would ignore the garden most of the summer. 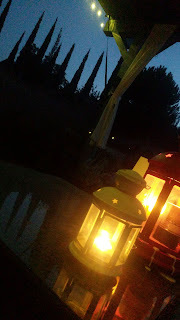 But last year was kind of the first time i figured out how to spend the summer in the garden, and actually enjoy it! This was also my "welcome home" ritual each weekend, to kind of reset from a crazy week. 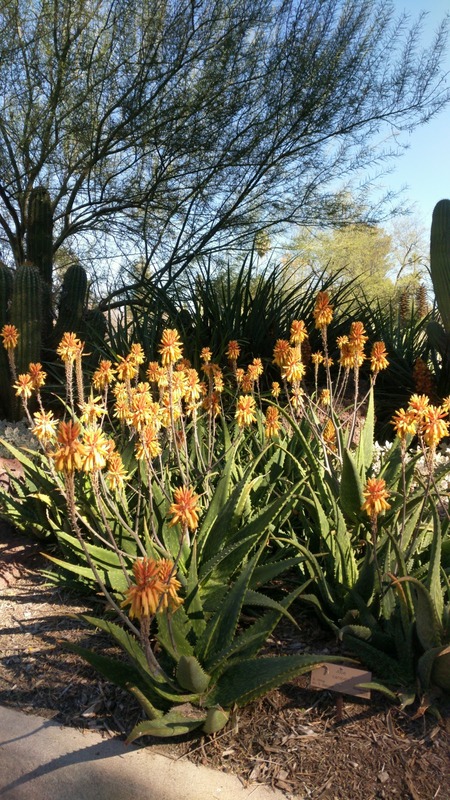 I need that reminder on a regular basis also! these pictures are from the summer... would it have killed me to straighten the pillows?! I kept the hummingbird feeder stocked - keeping simple syrup in batches made it simple - and the birds appreciated it! 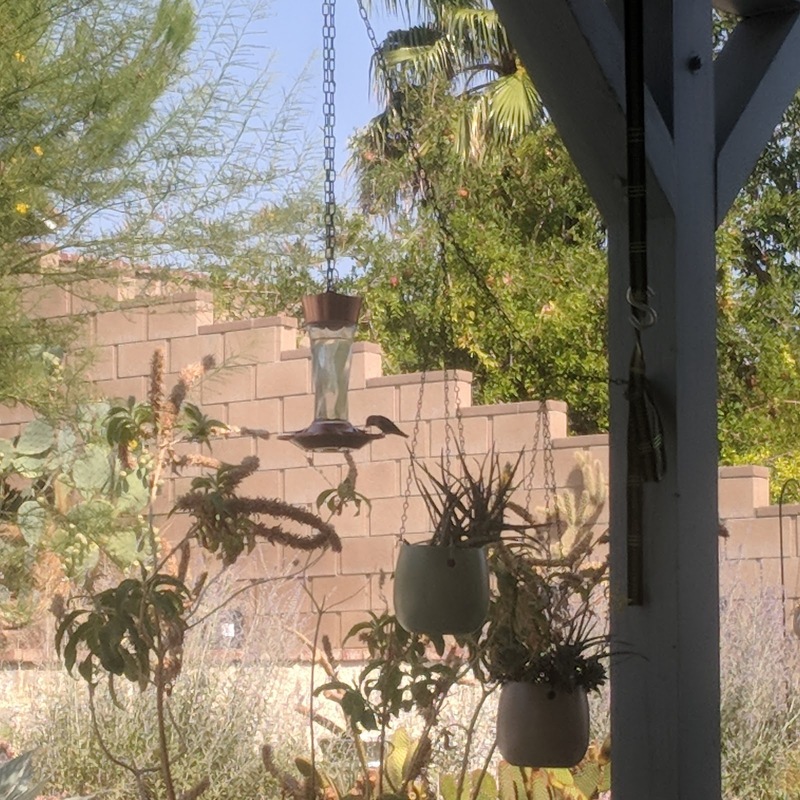 the combination feeder & hanging pots was approved by the hummers! At some point, i would grab the watering can and walk up the hillside to the bougainvilleas on the top of the hill. 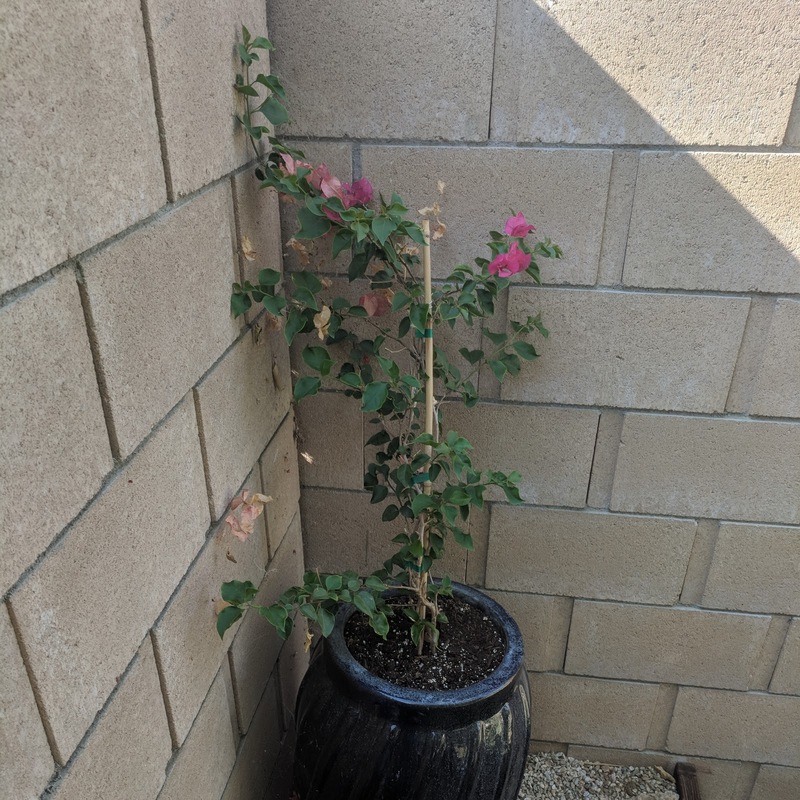 I actually managed to keep them alive all summer! 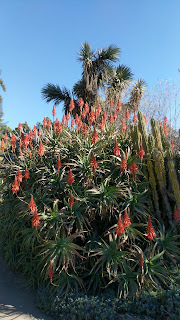 They are still there as i write this (march) so hopefully they will come back after this winter. 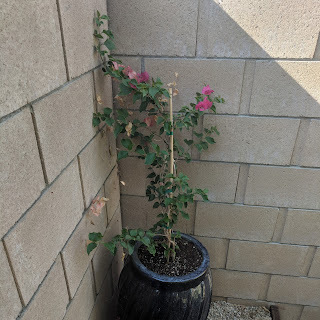 But still, this was about 4 months longer than i've been able to keep them going in the past. 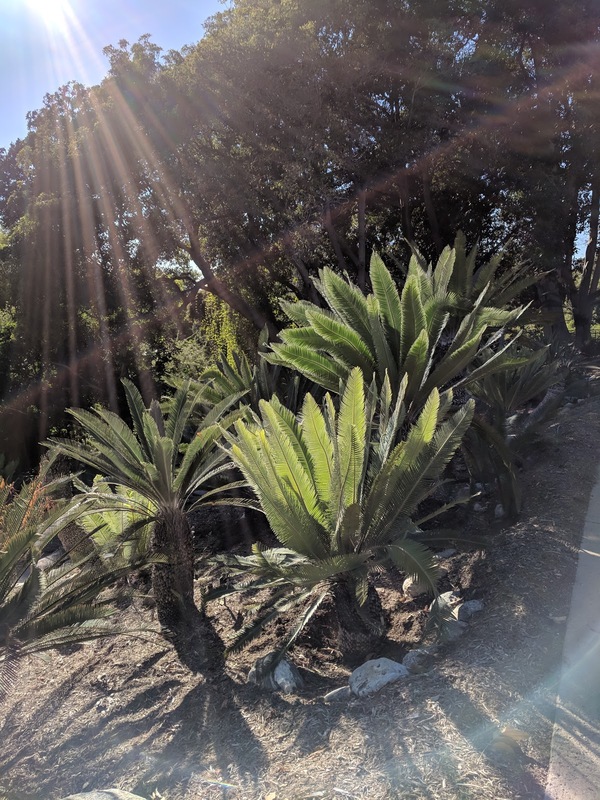 The rest of the pots on the hillside have cacti and agave in them... Maybe i'll try one more vine this year! 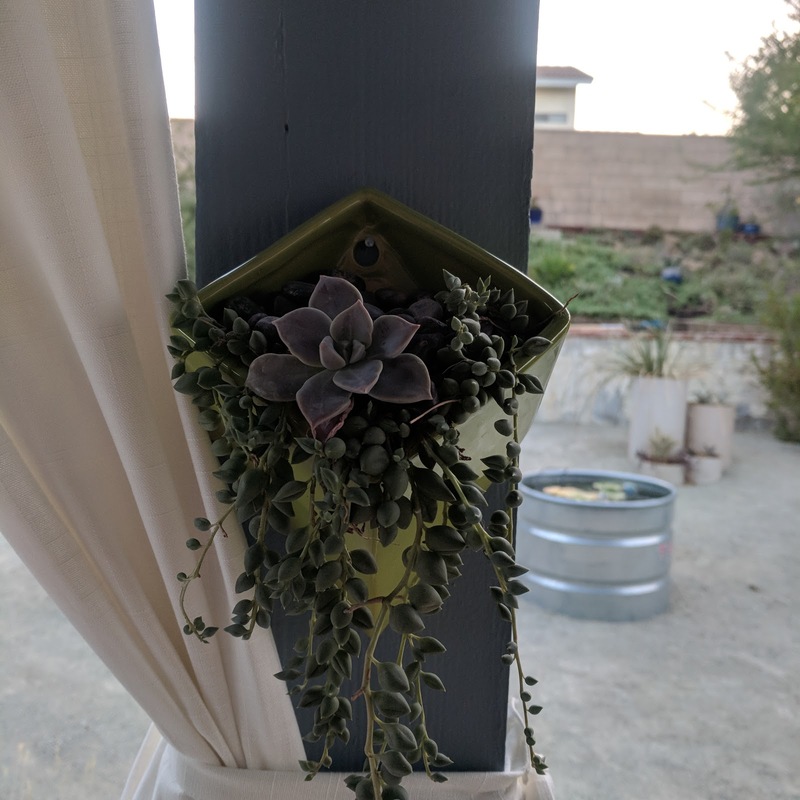 I would also water the succulent pots each weekend - using ice cubes! 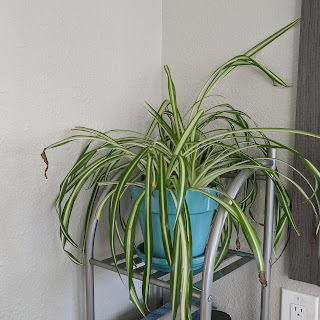 The two wall mounted ones had spilling plants in them - the first time i'd been able to keep those alive all summer. this one i bought at the Austin Fling! And at time, the combination of candles and solar powered lights made the patio great to hang out in, and have dinner, etc. 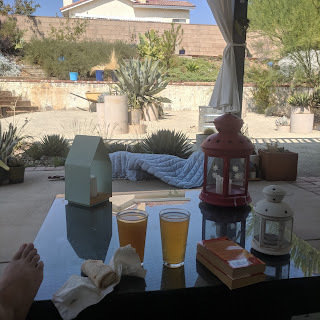 This was really the first summer that made me feel like i used the garden in the best possible way - to relax, to have fun, and to hang out in, even in the middle of the heat. 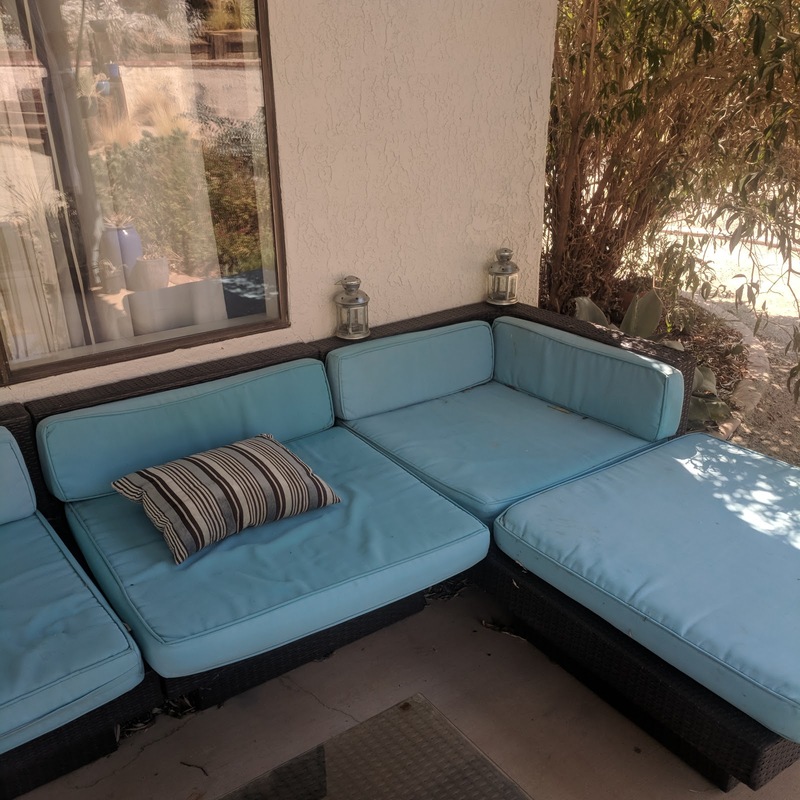 As i look back at these pictures, i can see some things i want to improve (better storage, cleaning up tools, maybe some more pillows?) 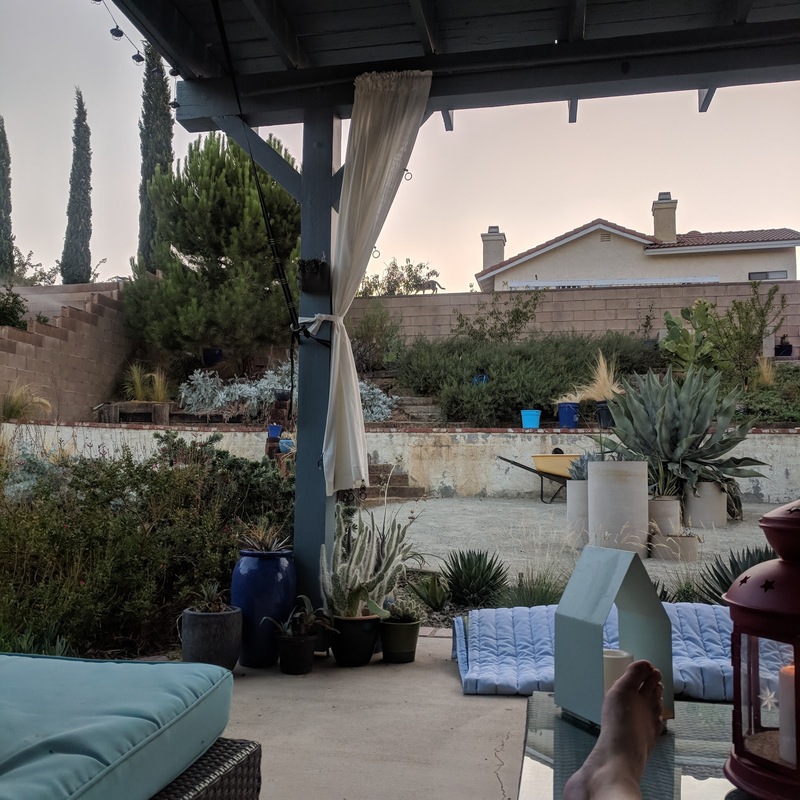 but if i can repeat this summer ritual again, 2019 will be great summer no matter what the heat! 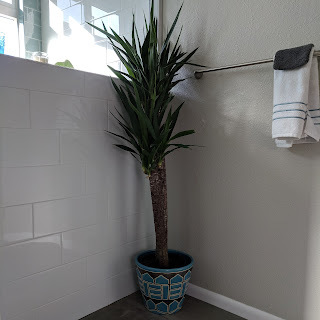 After watching Hoover Boo at Piece of Eden finish her "non-garden project" I realized i had never shared one of the more exciting indoor gardening projects I finished last year. After a leaking pipe in the wall necessitated a major master bathroom remodel (as well as other things, the joy of remodeling...), our master bath suddenly had way more light. And you know what that means - more plants! 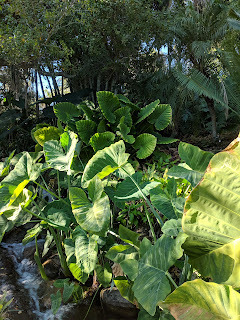 Especially plants i can't grow outside here, because they need lots of water/humidity/have large leaves, etc etc. 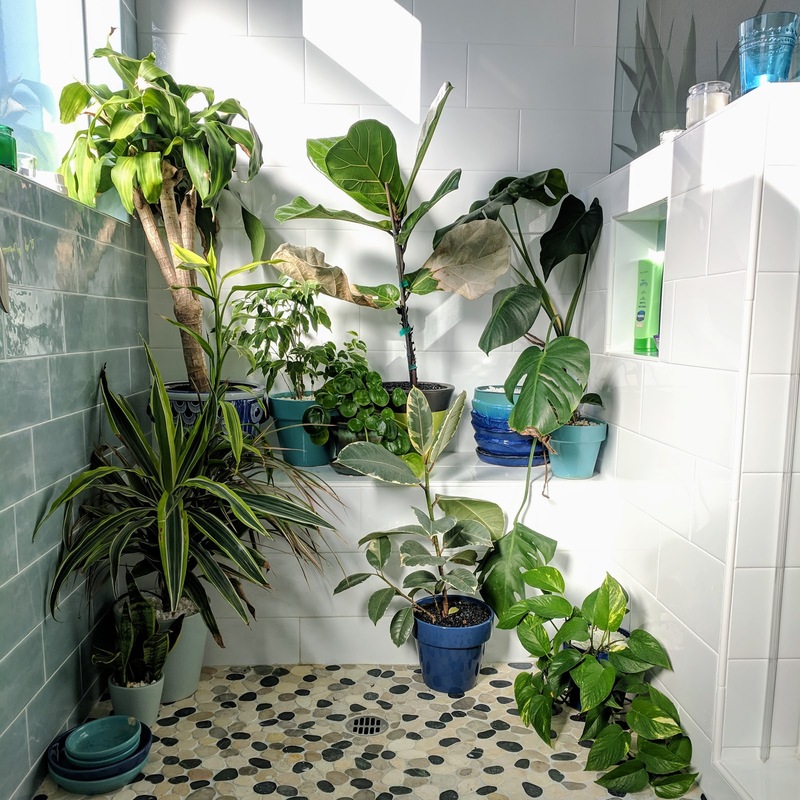 The shower colors are mostly white and blue-ish, so that's what made the pot colors work. 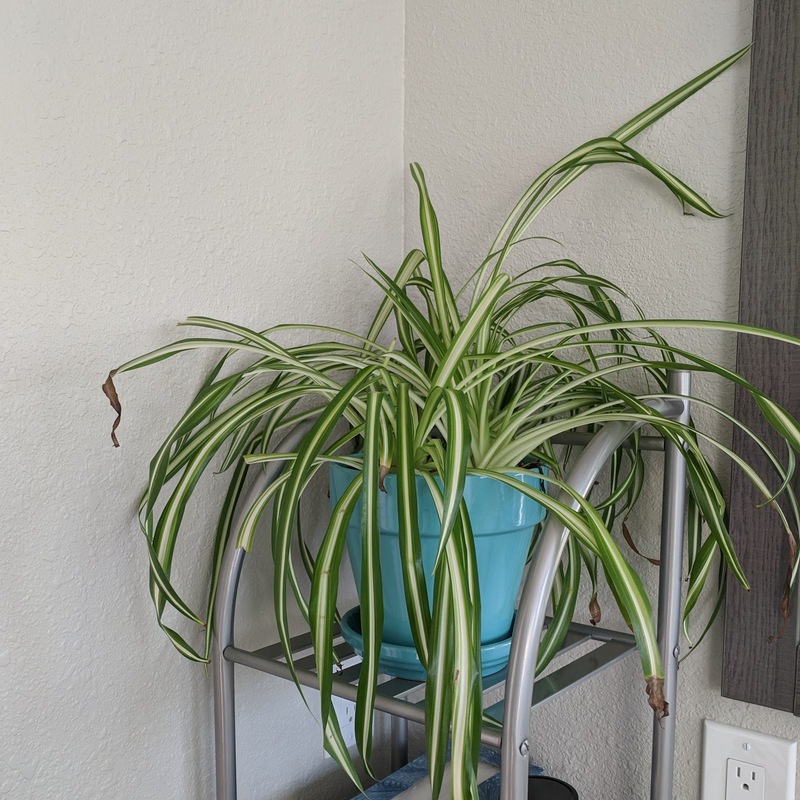 Some of these plants were already living in the house, just not in places that made them very happy. Initially, all the pots had saucers, but that actually let to too much water (not a problem i'm very familiar with!) 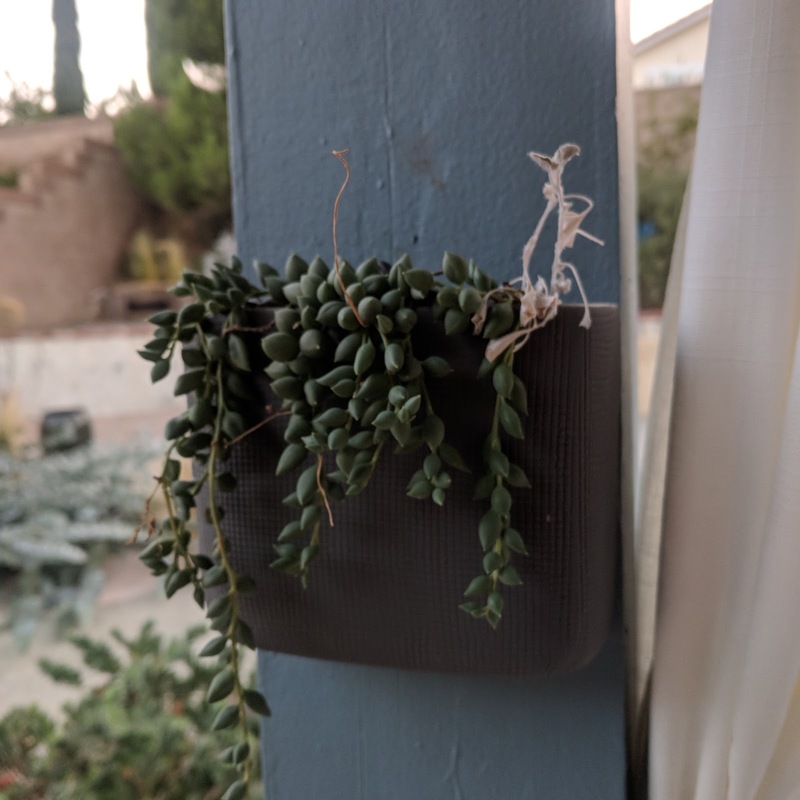 so now all the pots drain. 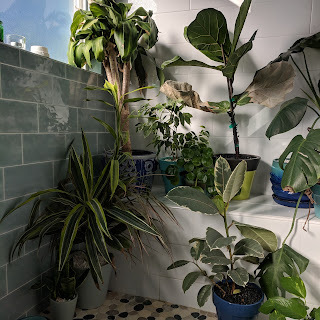 The nice part of them being in the large shower enclosure is that watering and draining becomes very easy. 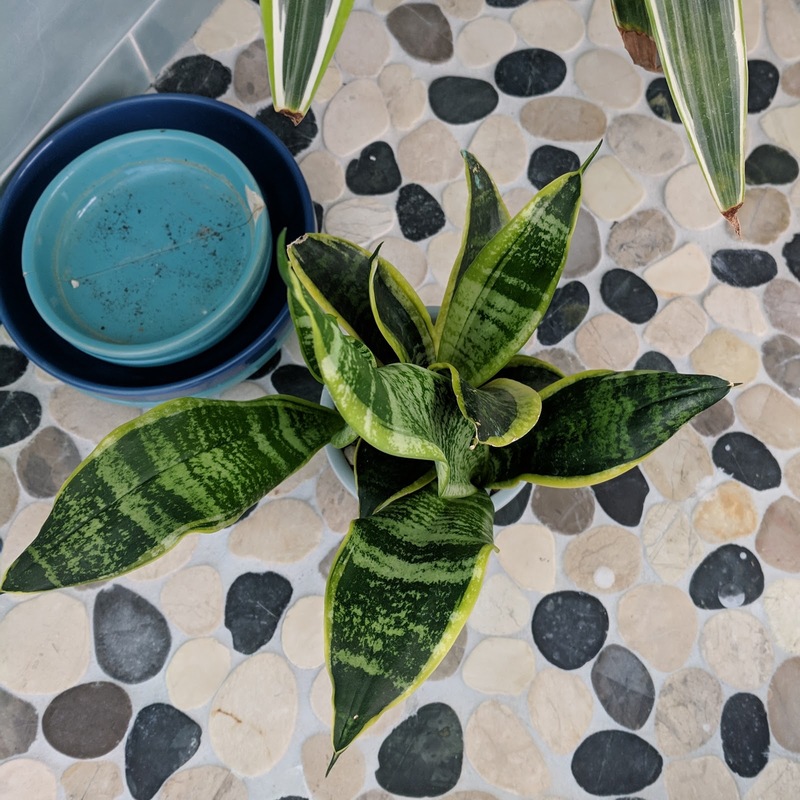 My houseplants usually never look this happy! 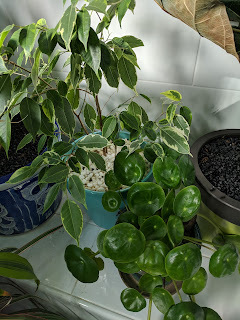 Even outside of the shower enclosure, there's now enough light for more plants! It reminded me that last year, right after the Austin Fling, i spent a weekend in Downtown LA. And even though i had just had a great weekend of visiting gardens in Austin, i couldn't get enough. 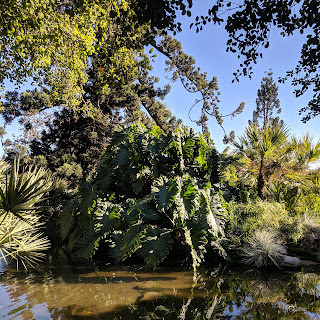 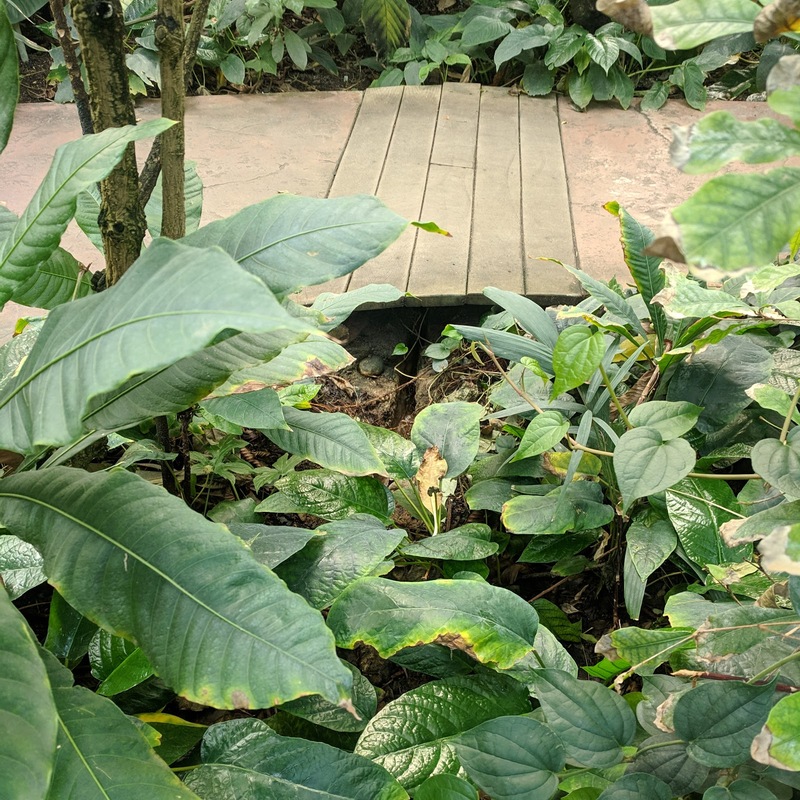 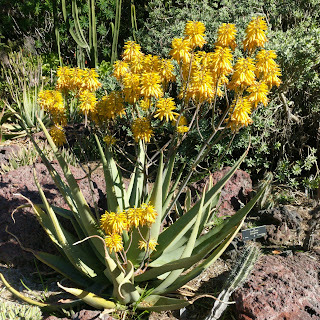 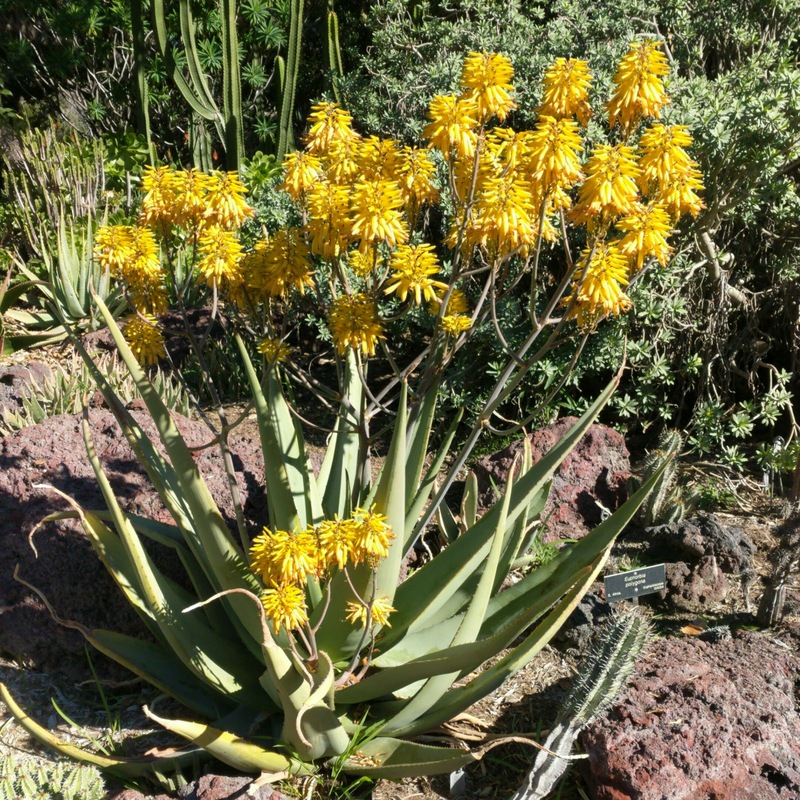 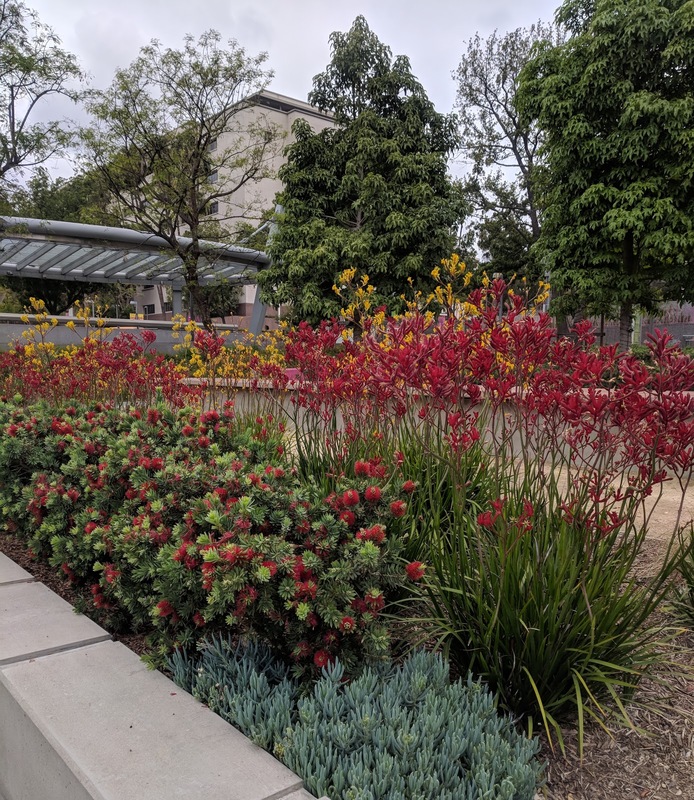 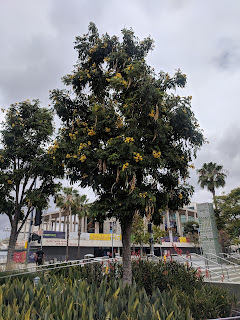 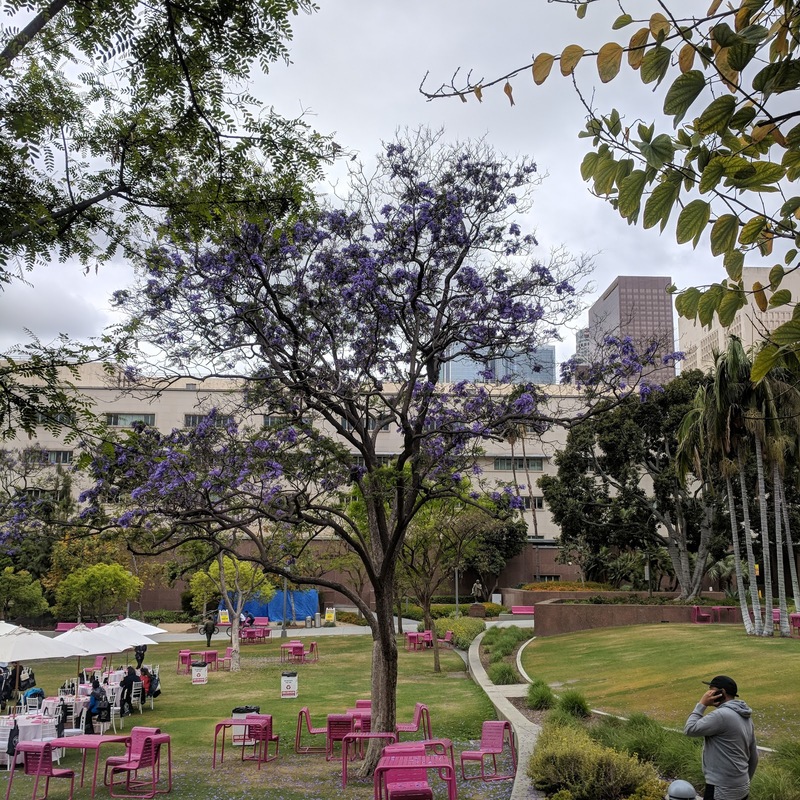 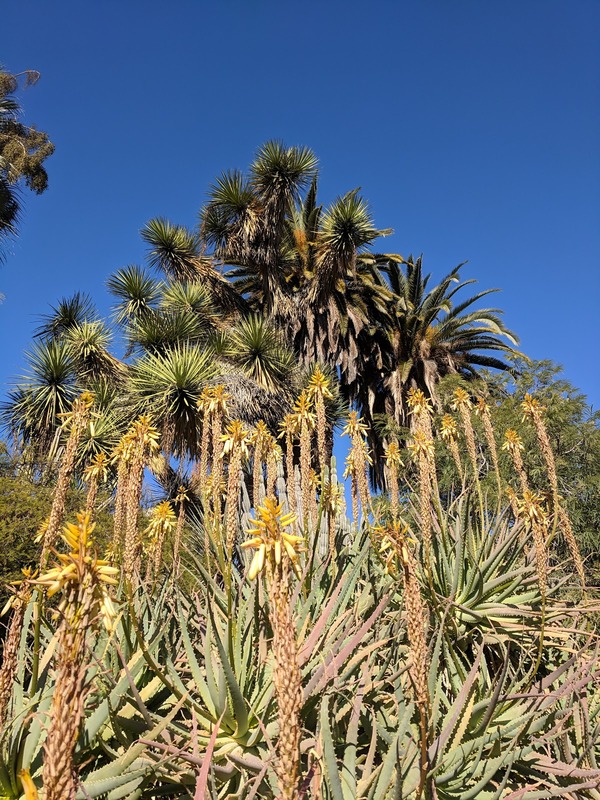 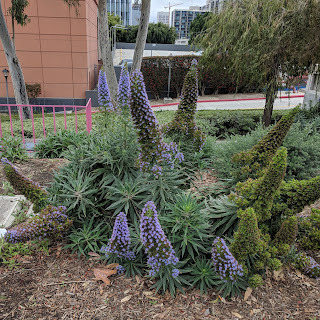 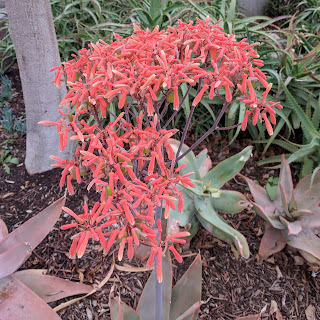 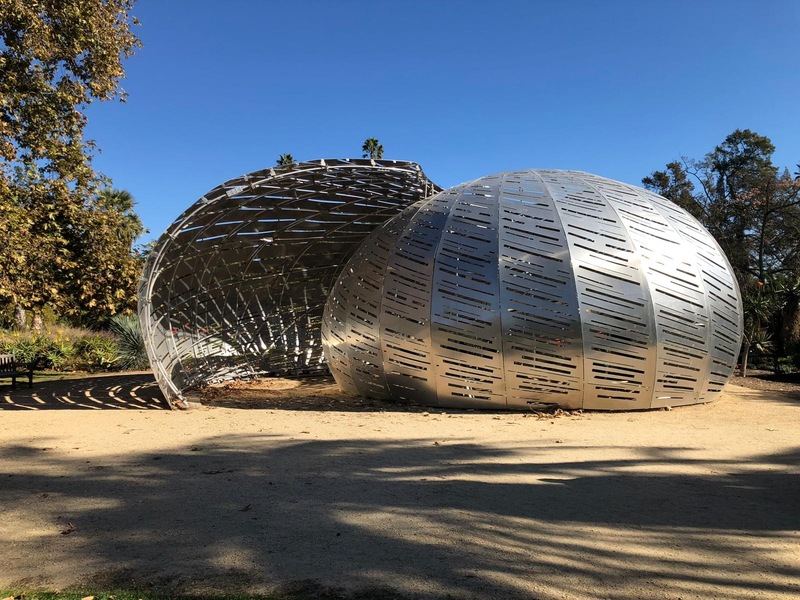 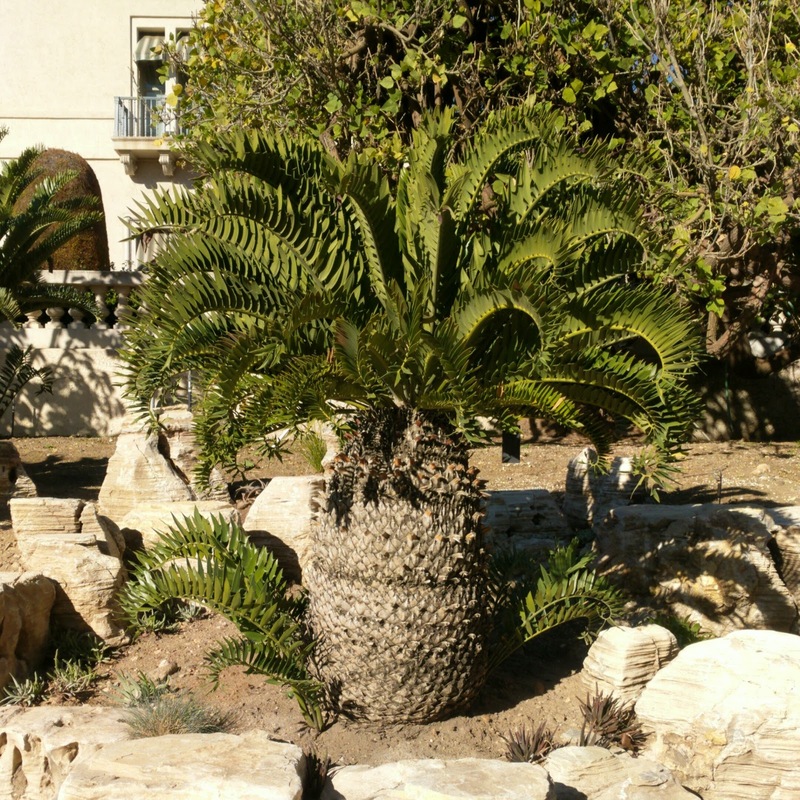 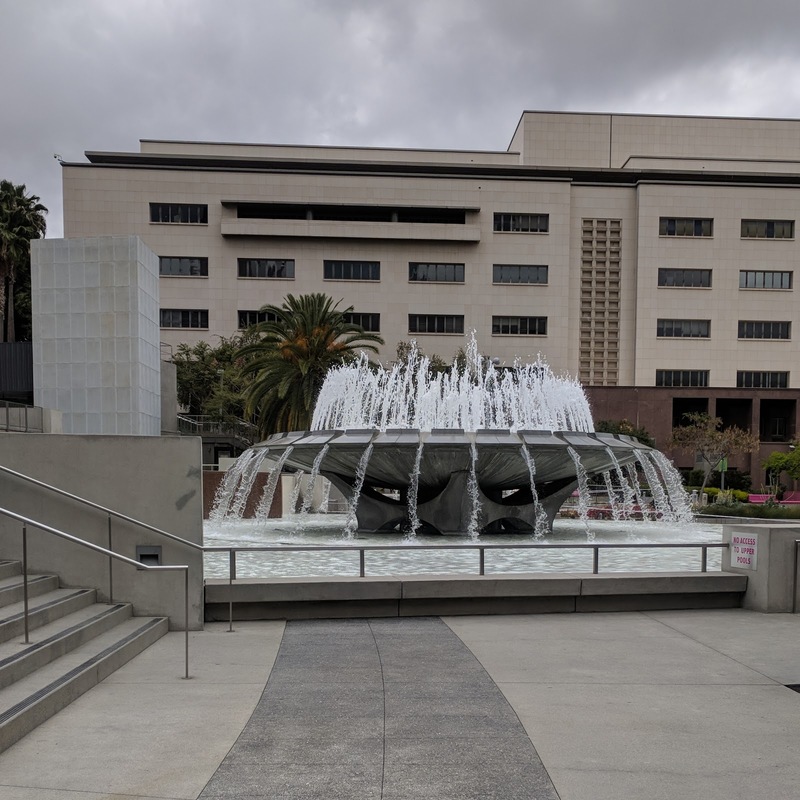 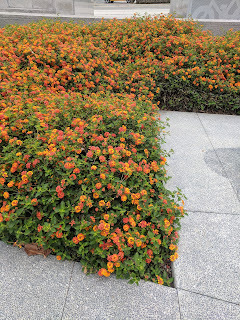 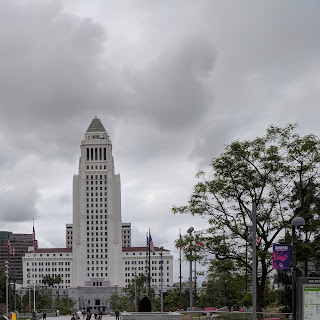 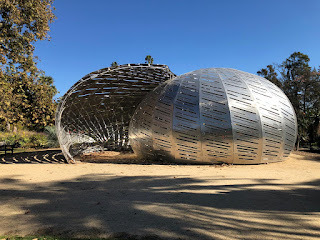 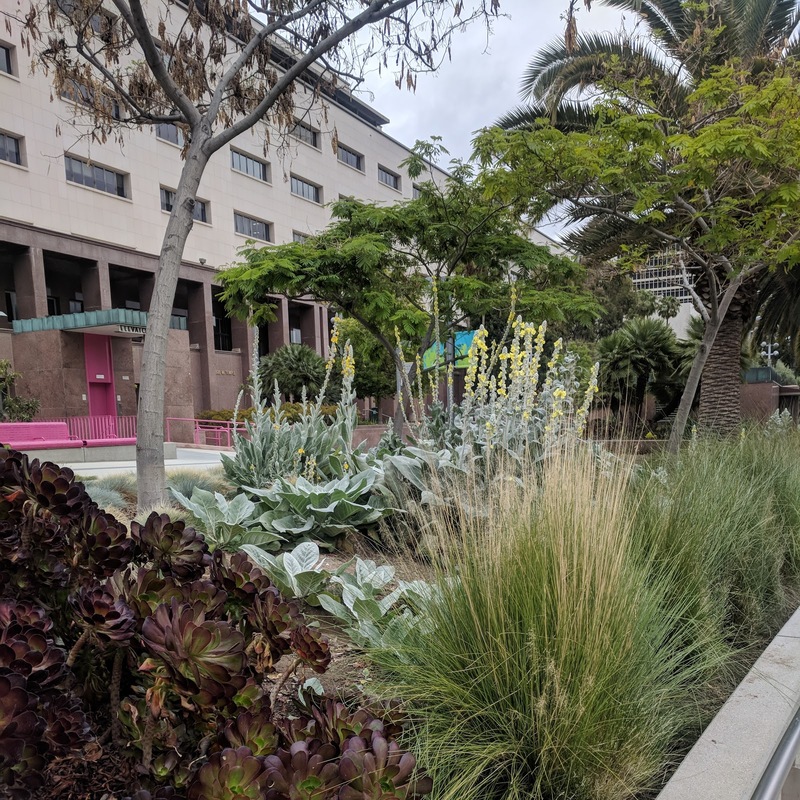 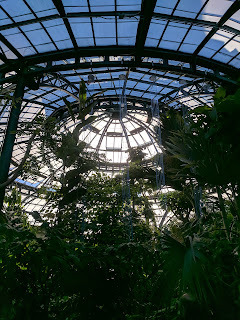 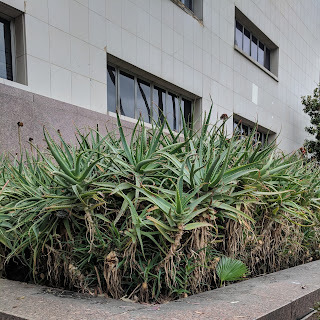 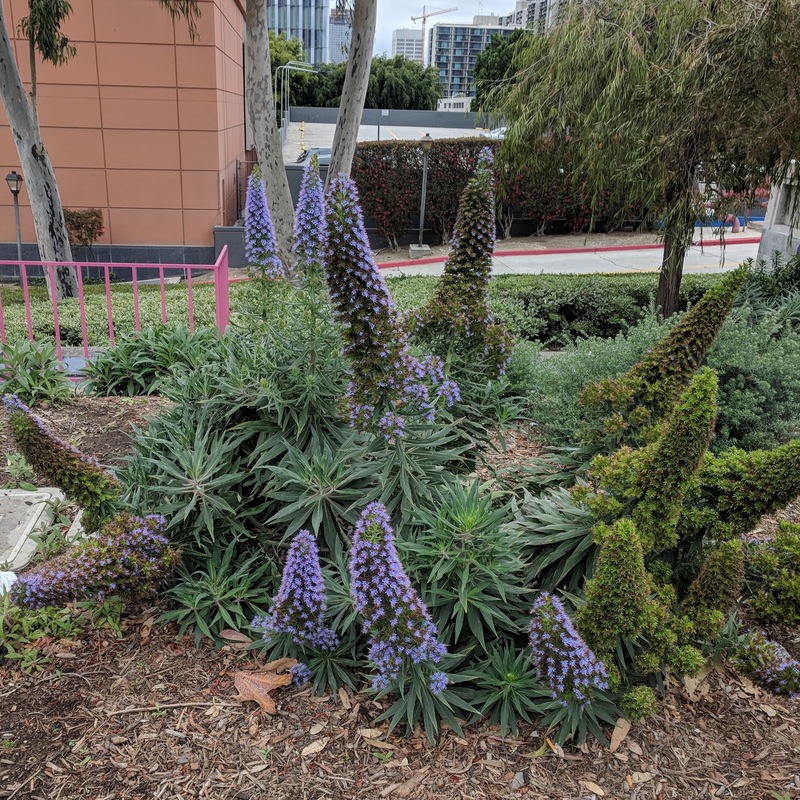 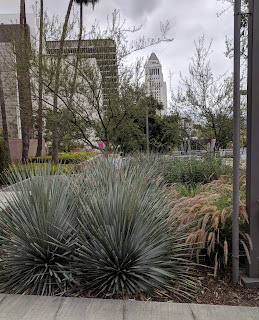 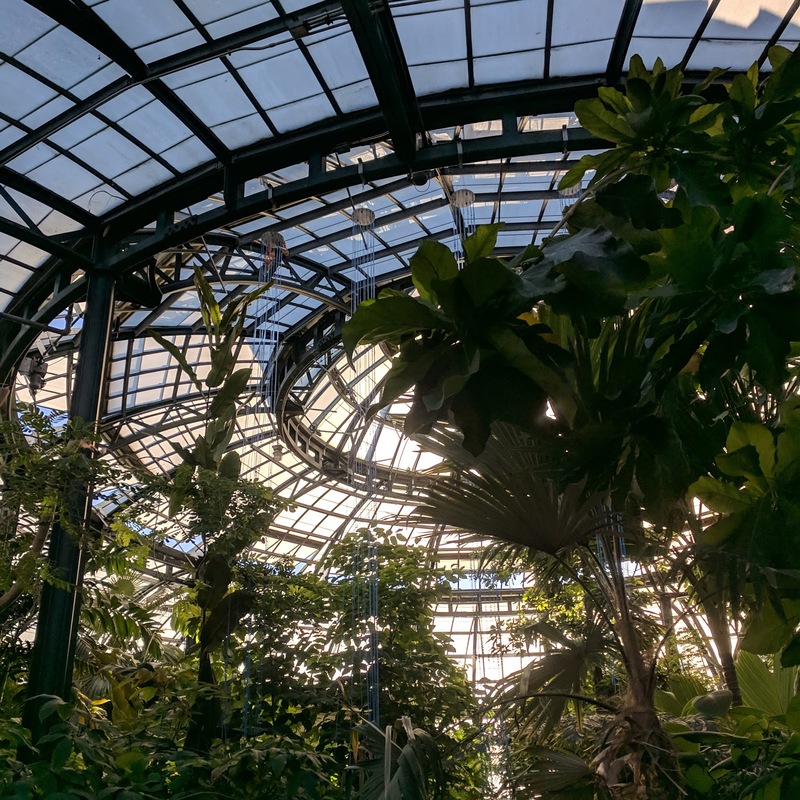 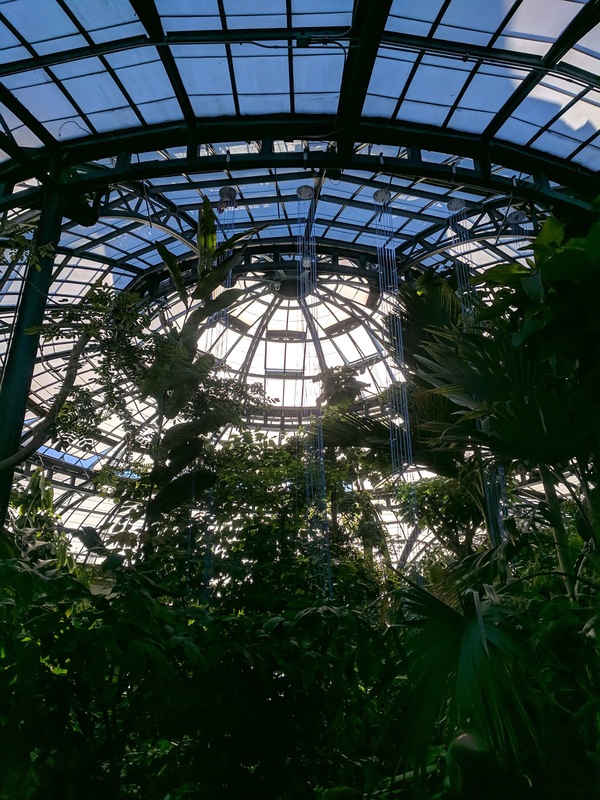 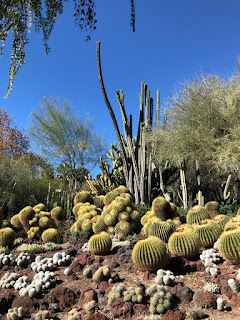 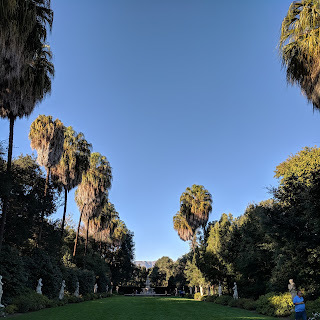 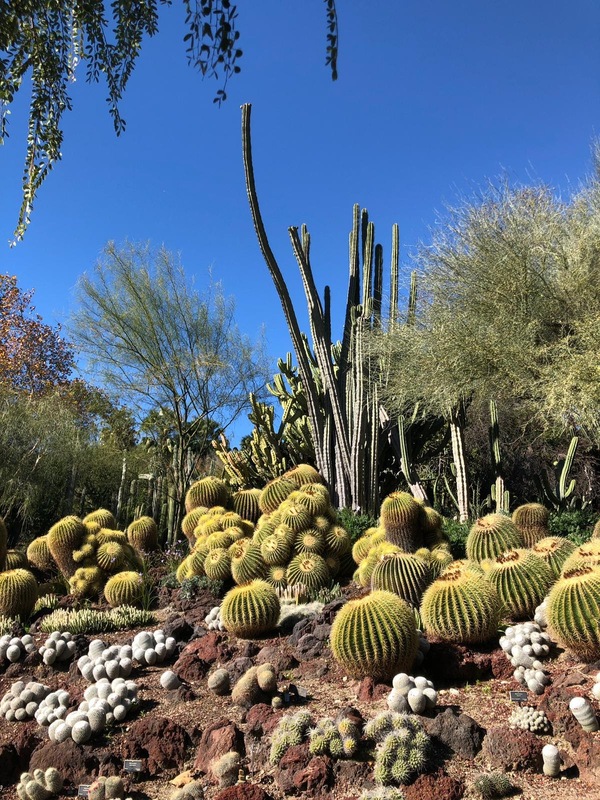 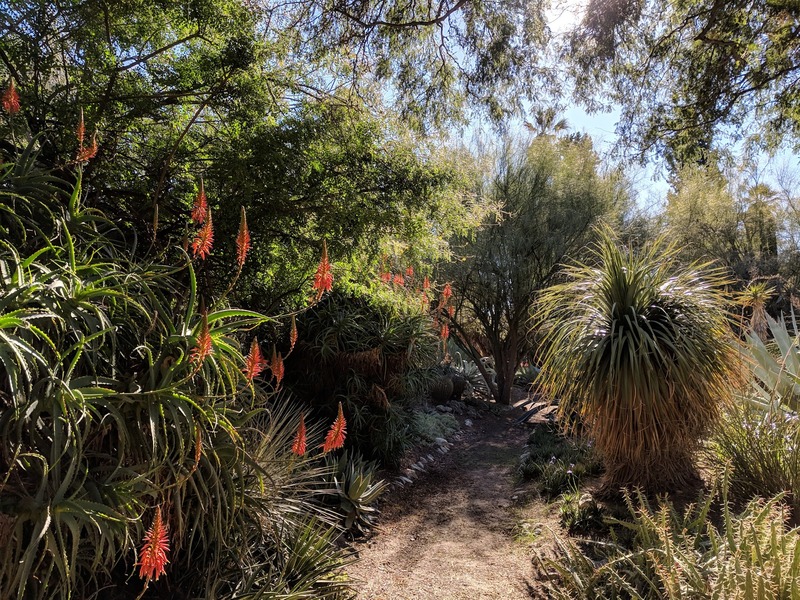 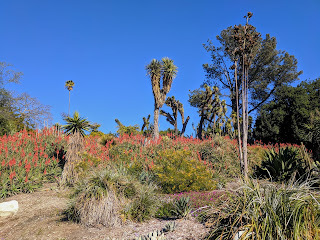 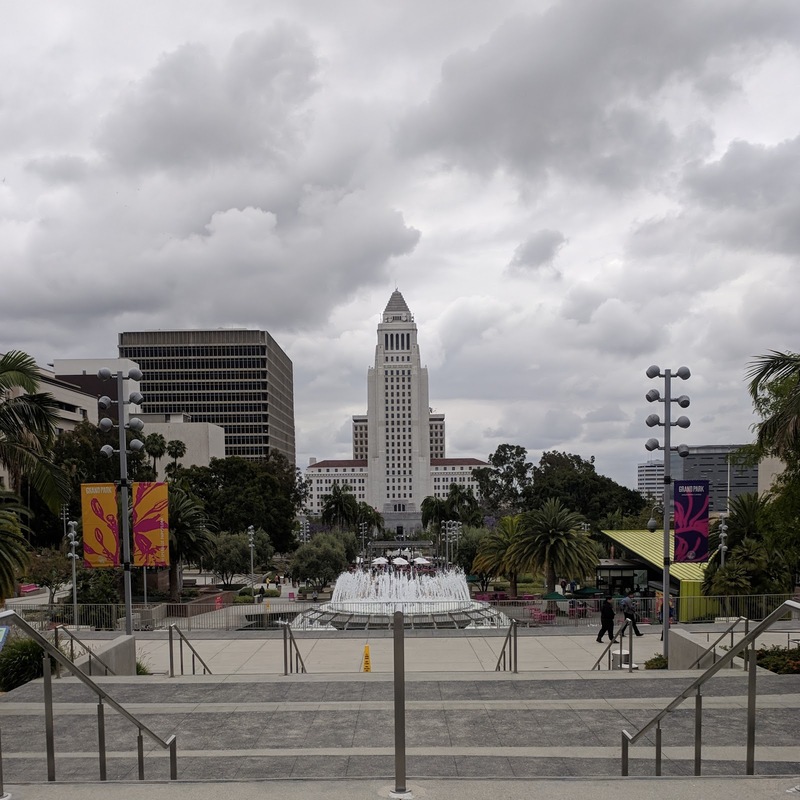 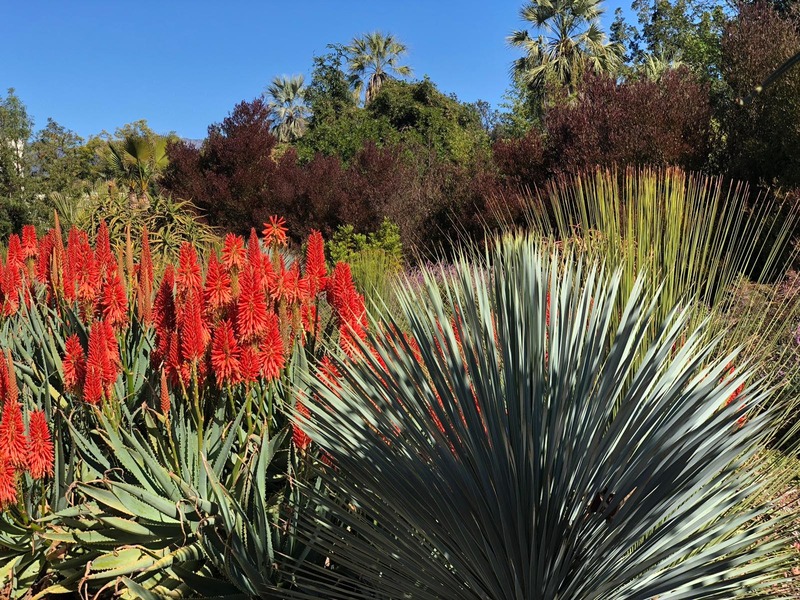 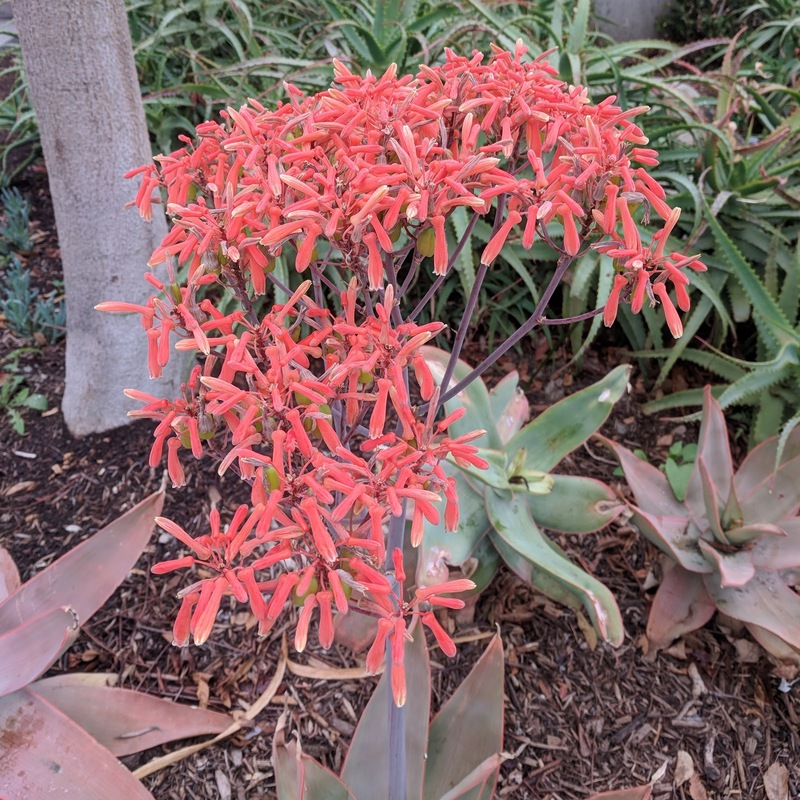 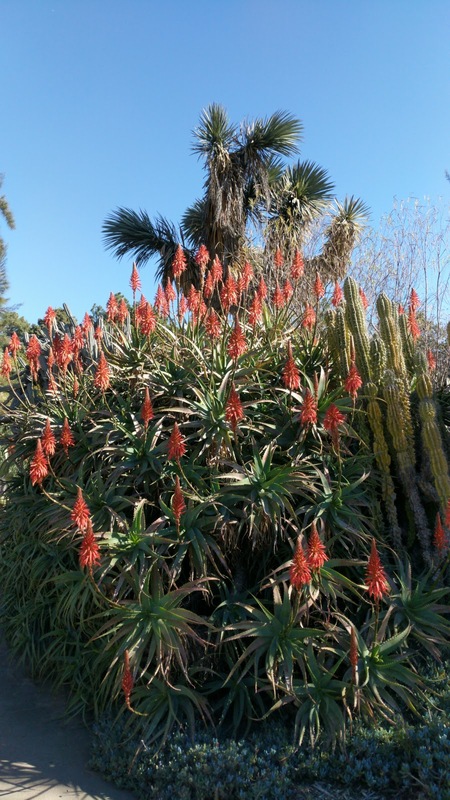 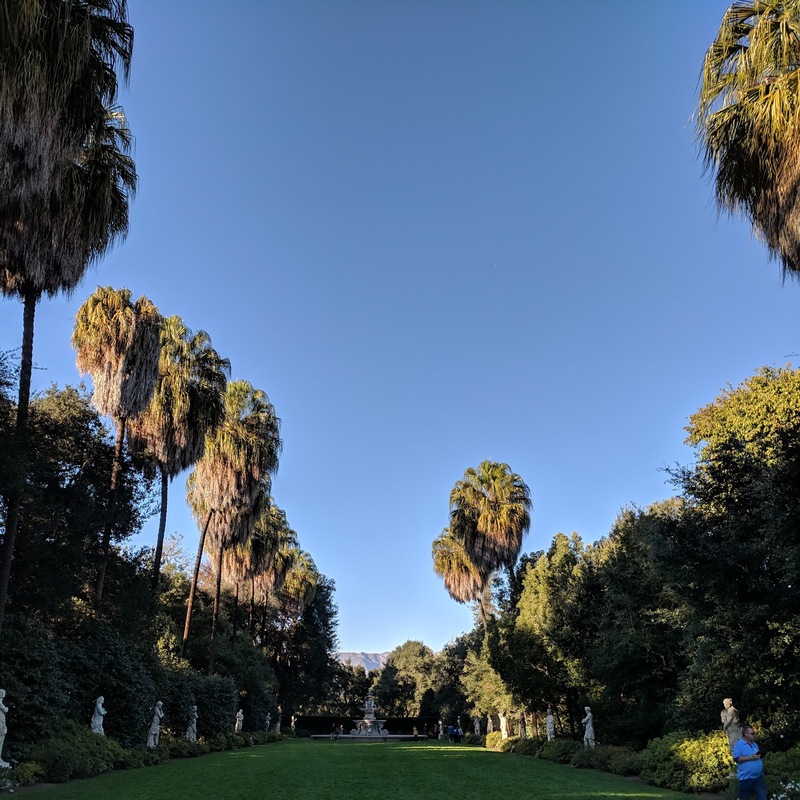 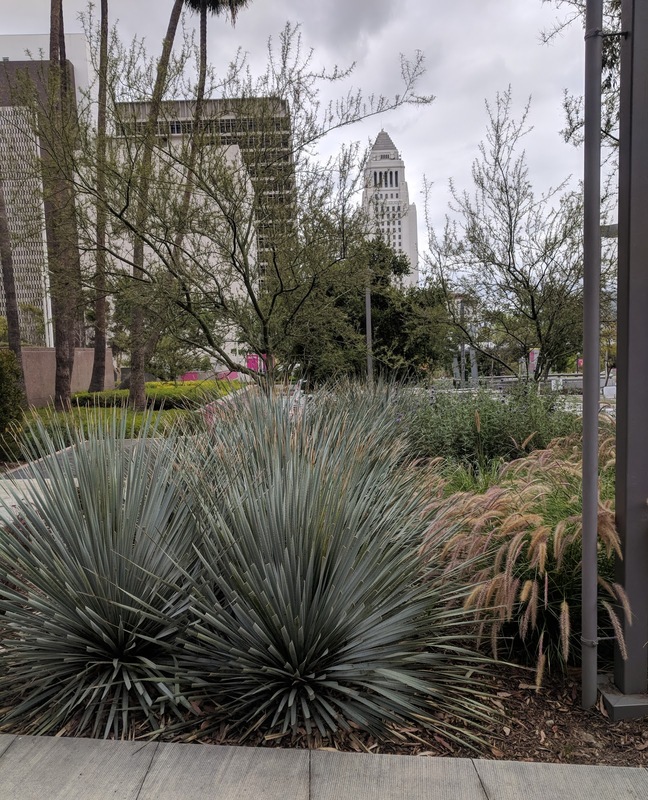 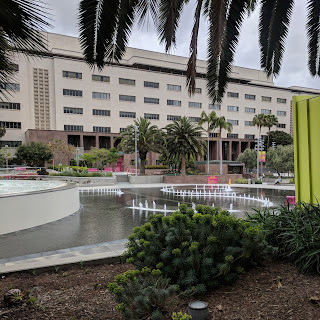 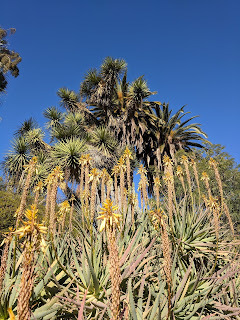 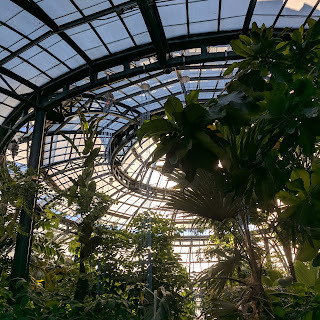 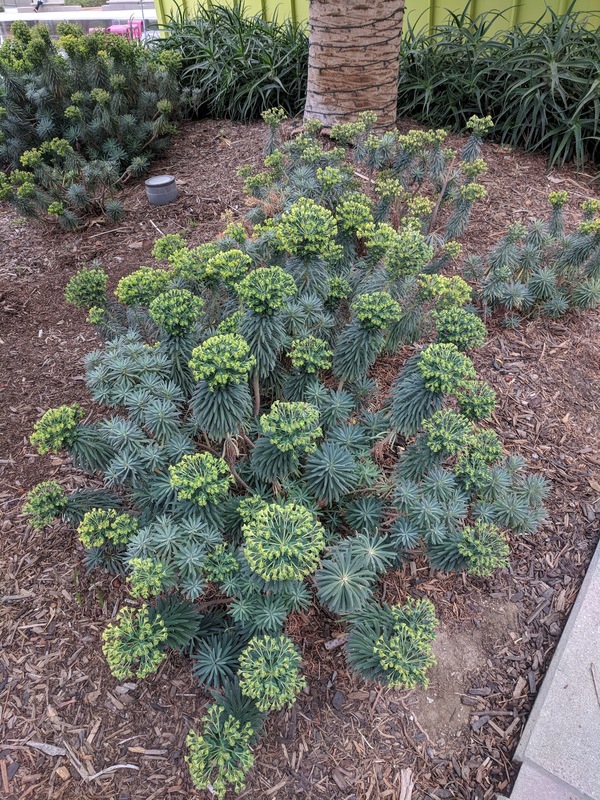 I've written about my visit to a community garden, and to the Blue Ribbon garden, but Grand Park (The Park for Everyone) also had some great plants and views to share. These pictures are from May 2018! 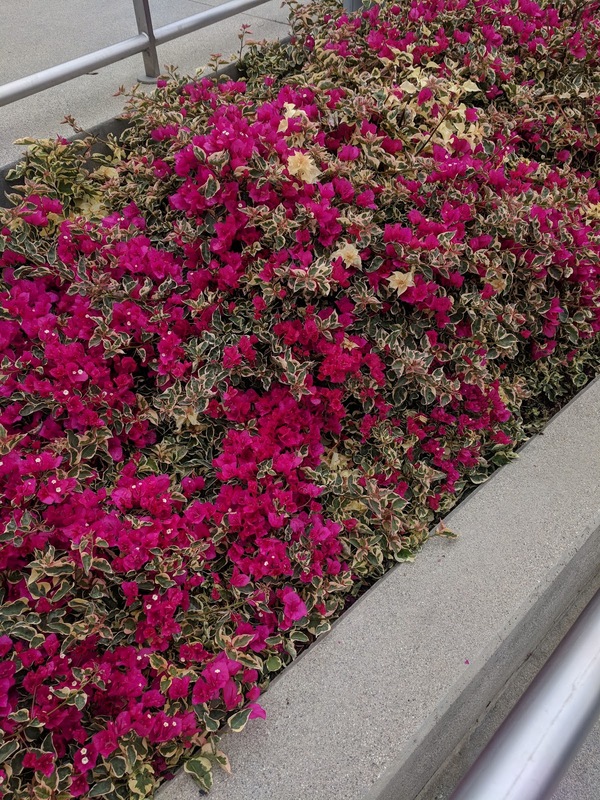 the flowers and the sign! 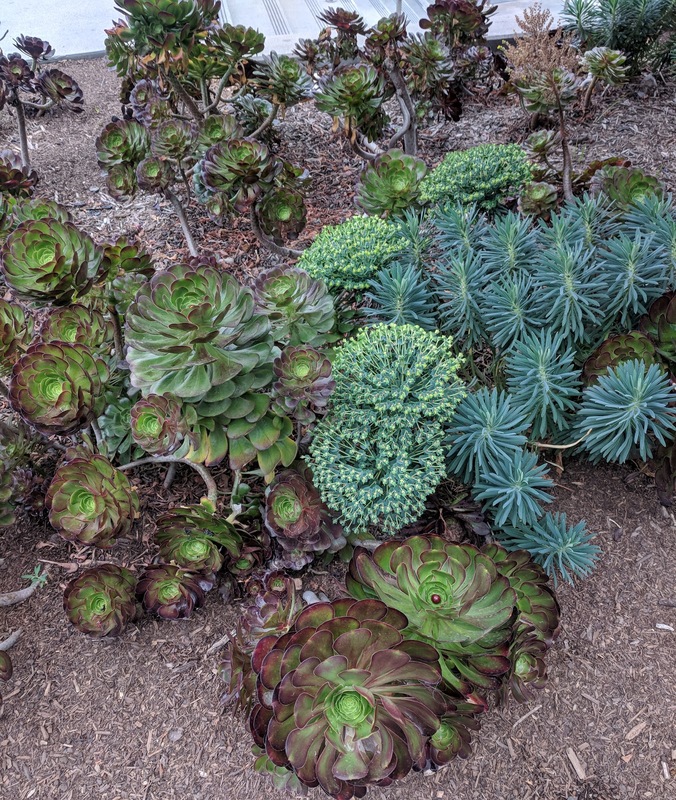 a whole bunch of them! 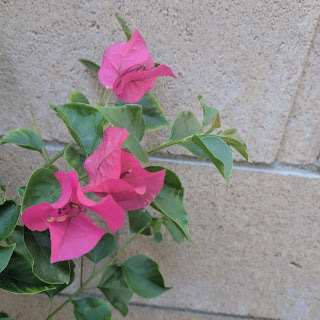 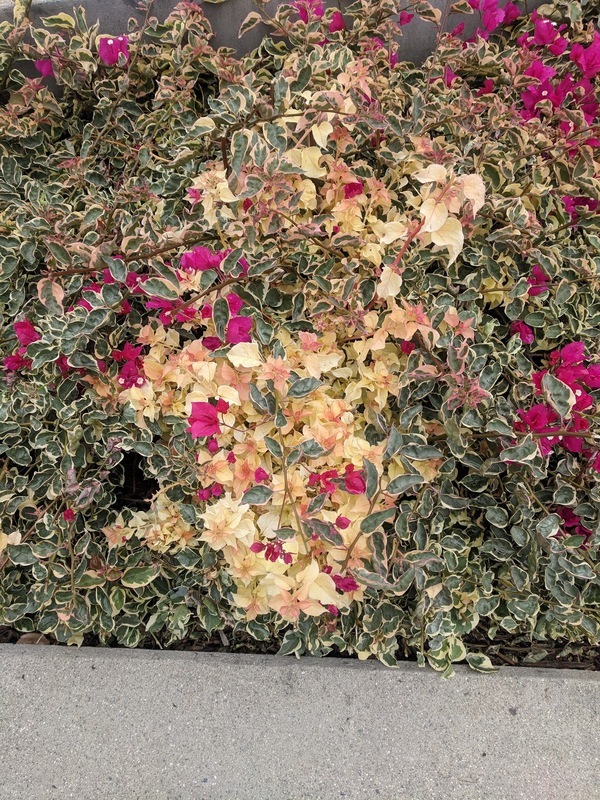 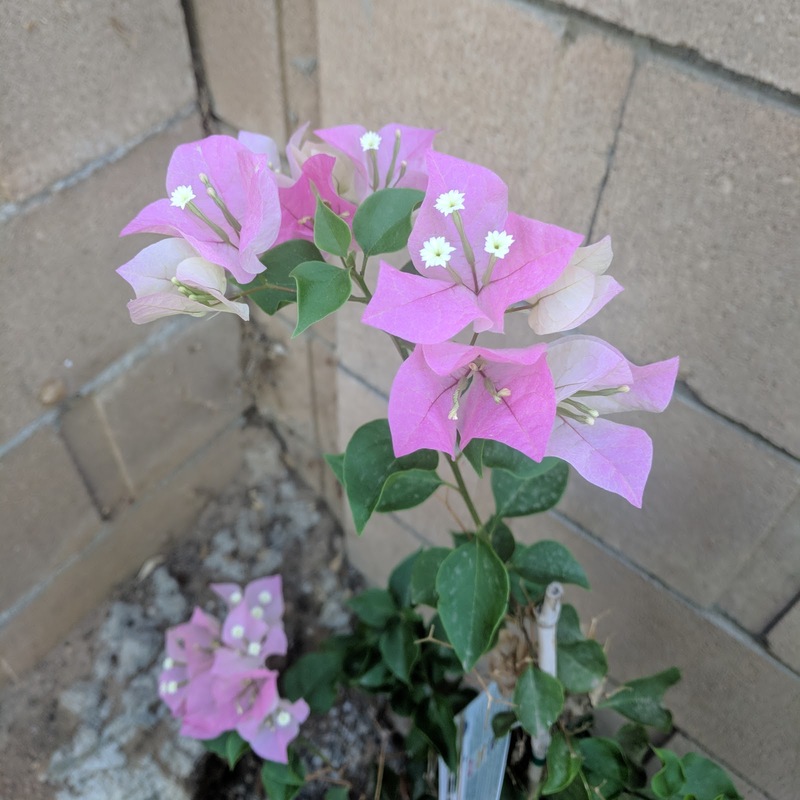 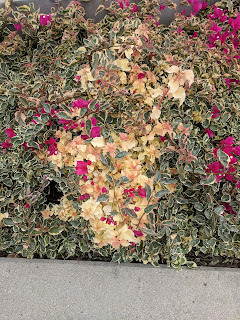 A great use of this sometimes unruly vine - i only wish my bougainvillea looked this good! 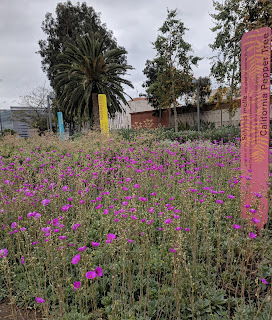 pretty cool for a public park. 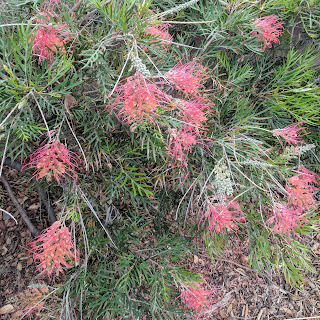 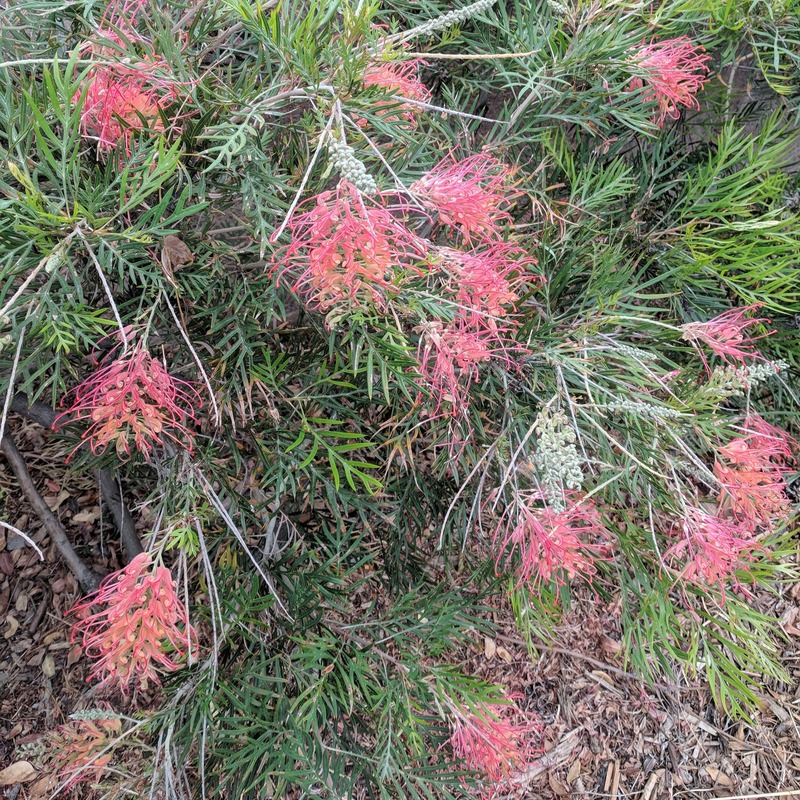 This cool flowering tree was at the top. 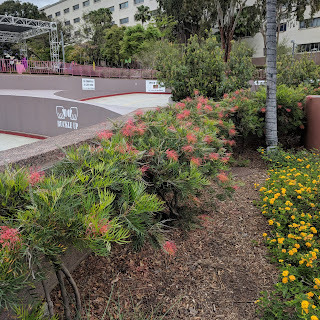 There weren't any (many?) 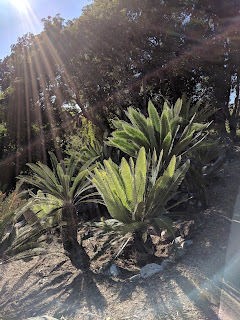 signs identifying the plants used, which was maybe the only downside? but maybe only for gardeners! This was a great garden to look back on! And now i'm thinking that maybe i'm over due for a DTLA staycation again! 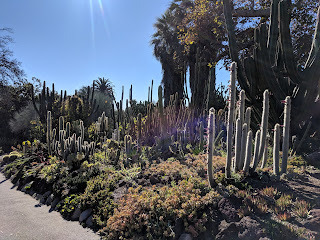 i'll have to visit again!